Purchase this top rated 999 pure 1 oz silver coin featuring the Koala from the Perth Mint at the best price online. Your order may qualify for free shipping. The koala silver coin series from the Perth Mint was launched in 2007 and quickly became a favourite of both investors and collectors. The design on the reverse changes annually, but always features one of Australia's most beloved creatures in its natural habitat. The reverse of this issue is an image of a koala sitting beside a eucalyptus tree, with another tree in the background. The detailed engraving on this coin lives up to the Perth Mint's high standards. 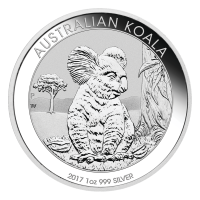 The words "Australian Koala 2017 1 oz 999 Silver" and the Perth Mint mark "P" complete the design. This is the first year the 1 oz Koala has a limited maximum mintage of only 300000 coins. We expect these to sell out fast, order yours soon! Reverse Koala walking on a eucalyptus branch and the words "Australian Koala 2017 1 oz 999 Silver" and the Perth Mint mark "P"
Koala walking on a eucalyptus branch and the words "Australian Koala 2017 1 oz 999 Silver" and the Perth Mint mark "P"
1 oz 2017 Australian Koala Silver Coin Purchase this top rated 999 pure 1 oz silver coin featuring the Koala from the Perth Mint at the best price online. Your order may qualify for free shipping. The koala silver coin series from the Perth Mint was launched in 2007 and quickly became a favourite of both investors and collectors. The design on the reverse changes annually, but always features one of Australia's most beloved creatures in its natural habitat. The reverse of this issue is an image of a koala sitting beside a eucalyptus tree, with another tree in the background. The detailed engraving on this coin lives up to the Perth Mint's high standards. The words "Australian Koala 2017 1 oz 999 Silver" and the Perth Mint mark "P" complete the design. This is the first year the 1 oz Koala has a limited maximum mintage of only 300000 coins. We expect these to sell out fast, order yours soon!